Today’s post is an update post, to make sure you guys don’t miss out on some contests and other things that will be ending soon. But first! I’m overly excited about something that might seem rather silly. A few days ago I got my publicity materials for The Bloody City (which will be releasing November 10th) and I found out my publisher put me in a real life magazine ad! 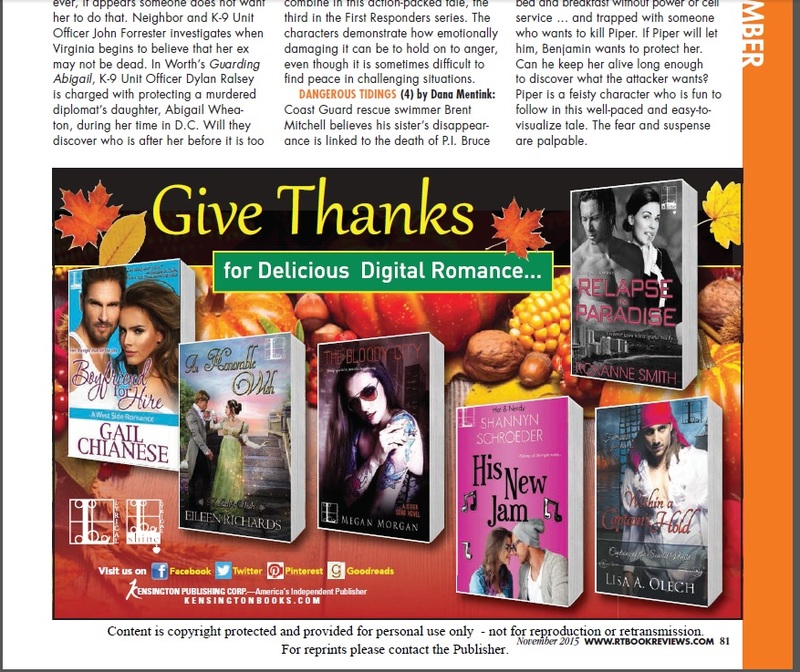 The Bloody City is featured in an ad in the November 2015 issue of RT Book Reviews. I found a digital copy online (which you can access for free here, for a limited time) just to see what it looked like. Of course, I ordered myself some paper copies–I have to hold it in my hands! It’s a big deal to me…I’m in a magazine! I’m worth throwing advertising money at! Yay! Time is running out to enter to win a copy of The Bloody City on Goodreads. You have three days left if you want to enter. Go, go, go! You can also request The Bloody City for review from NetGalley, from now until release day. If you run a review site and you want to review it, please contact me and I will send you a direct download link for NetGalley. Last of all, I only have three days left to obtain four–JUST FOUR–nominations in order for The Wicked City to move on to the voting round of The Romance Reviews Readers’ Choice Awards. I should clarify, this is NOT the contest itself, but merely a nomination round to get into the contest, and I’m so, so close! If you think I’m worthy, I would deeply appreciate your nomination. You have to sign up for the site to nominate, which you can do here (you can also easily sign in with Facebook, G+, or Microsoft). And then click on the banner below (or here) to nominate the book by clicking the blue button above the cover. Easy! Everyone who gives me a nudge into the voting round is greatly, greatly appreciated!